5S – Kaizen 5S – 5S Analysis – Five S – 5S Framework – 5S Business Methodology – 5S model is an approach to solving business problems. Below sample images are examples of 5S used in business management. 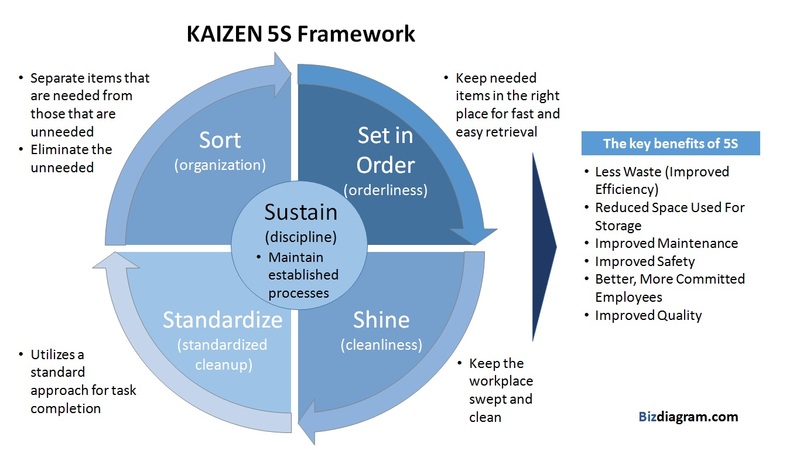 5S is a Lean Six Sigma structured method to getting a workplace cleaned up (eliminating waste), organized, standardized and then sustaining the improvements made. Five S name is based on the five Japanese words starting with S. Below is the image of this framework and key benefits of 5S model. Copyright © 2019 Tasko Consulting . All Rights Reserved.